1,100 cattle on offer at Thursday’s cattle sales with all six rings reporting a strong demand for all types. Light weight bullocks selling from 215 to 256ppk for a Limousin 390kg at £1,000, medium weights selling from 210-254ppk for a Charolais 422kg at £1,075, heavy lots selling from 190 to 228ppk for a Charolais 506kg at £1,155 and selling up to at £1,445 per head. Fivemiletown producer Limousin 390kg at £1,000, Roscor producer Charolais 422kg at £1,075, Garrison producer Charolais 430kg at £1,085, Charolais 400kg at £1,000, Tempo producer Limousin 422kg at £1,060, Lettermore producer Charolais 402kg at £1,000, Lisnaskea producer Charolais 750kg at £1,445, Florcecourt producer Charolais 730kg at £1,435, Coa producer Charolais 664kg at £135, Charolais 638kg at £1,310, Charolais 640kg at £1,355, Charolais 690kg at £1,365, Charolais 630kg at £1,340 and Aughnacloy producer Charolais 690kg at £1,375 and Charolais 698kg at £1,330. 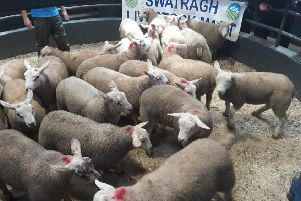 In the weanling ring steers and bulls sold from £700 to £1,005 paid for a 385kg Charolais while heifers ranged from £650 to £1,030 for a 340kg Charolais. Enniskillen producer 340kg Charolais heifer at £1,030, 291kg Charolais bull at £855, 360kg Charolais heifer at £1,000, 355kg Charolais heifer at £975, 405kg Charolais bull at £970, 404kg Charolais bull at £995, 360kg Charolais bull at £920, 345kg Charolais bull at £900, Belcoo producer 270kg Charolais heifer at £655, 368kg Charolais heifer at £790, 305kg Charolais bull at £895, 350kg Charolais steer at £880, 368kg Charolais steer at £885, Kesh producer 360kg Charolais bull at £1,000, 335kg Charolais bull at £900, 335kg Charolais heifer at £725, 325kg Charolais bull at £870, 340kg Charolais bull at £870, Garrison producer 315kg Charolais heifer at £705, 302kg Charolais heifer at £700, 385kg Charolais heifer at £850, 332kg Charolais heifer at £775, 340kg Charolais heifer at £785, 418kg Charolais heifer at £940, 395kg Charolais heifer at £1,030, Newtownbutler producer 261kg Limousin heifer at £635, 374kg Charolais steer at £865, 338kg Charolais steer at £845, Derrygonnelly producer 425kg Charolais bull at £900, 375kg Charolais heifer at £900, 410g Charolais bull at £925, 345kg Charolais heifer at £800, Springfield producer 355kg Charolais bull at £975, 258kg Limousin bull at £880, 420kg Charolais steer at £1,010 and Derrylin producer 416kg Charolais steer at £1005, 271kg Charolais bull at £765, 274kg Charolais steer at £850, 365kg Charolais steer at £975. Drumcose producer Hereford bull at £350, Letterbreen producer Aberdeen Angus bull at £320, Blonde d’Aquitaine heifer at £300, Fivemiletown producer Hereford bull at £300, Ballinamallard producer Hereford bull at £2850, Belgian Blue bull at £270, Aberdeen Angus heifer at £260, Monea producer Hereford heifer at £260, Derrygonnlley producer Belgian Blue heifer at £260, Kesh producer Aberdeen Angus heifer at £250, Enniskillen producer Friesian bull at £120 and Derrygonnelly producer Friesian bull at £90. Belcoo producer Charolais cow with bull at £1,600, Newtownbutler producer Charolais cow with heifer at £1,410, Aberdeen Angus cow with heifer at £1,160, Hereford cow with bull at £1,120, Kinawley producer Simmental cow with heifer £1,190 and Kesh producer Limousin cow with bull at £1,140, Simmental cow with bull at £1,190. Forward lots sold to 230ppk paid for a 610kg Charolais at £1,400 and a top of at £1,450 and lighter weights sold from 192-240ppk paid for a 455kg Charolais at £1,090. Lisnaskea producer Charolais 670kg at £1,450, Charolais 680kg at £1,340, Rosslea producer Aberdeen Angus 610kg at £1,400, Charolais 585kg at £1,200, Charolais 600kg at £1,230, Lisnaskea producer Charolais 640kg at £1,350, Derrylin producer Charolais 600kg at £1,260, Enniskillen producer Charolais 500kg at £1,130, Charolais 420kg at £965, Charolais 590kg at £1,275, Charolais 550kg at £1,190, Charolais 480kg at £1,060, Charolais 500kg at £1,090, Florencecourt producer Charolais 530kg at £1,130, Bellanaleck producer Charolais 500kg at £1,110 and Brookebourgh producer Charolais 500kg Charolais at £1,150 and Charolais 510kg at £1,100. Froward lots sold to 185ppk paid for a 740kg Charolais at £1,365, while lighter lots sold from 100-190ppk paid for a 500kg Charolais at £950 and Friesian cows from 70-123ppk for a 630kg at £780. Bellanaleck producer Charolais 740kg at £1,365, Charolais 696kg at £1,270, Derrygonnelly producer Charolais 6960kg at £1,220 and Florencecourt producer Charolais 770kg at £1,130.